Have you spent as much on developing your driving skills as you have on your car? 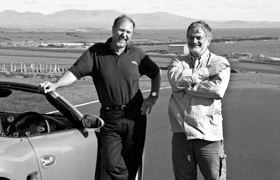 Masterclass is a two-day course with exclusive use of the track at Anglesey. Mark Hales and I have designed this course to help you develop your track driving skills to a very high level. The Masterclass is £1995 per person including VAT. Places are limited to six drivers per course. We provide the cars, fuel and insurance. Develop strategies that enable you to measure and improve your track driving. 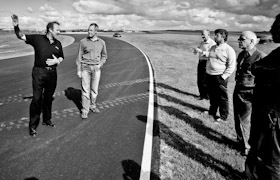 Our masterclass uses the fixed environment of the Anglesey circuit to focus upon the process of optimising your approach to driving any circuit. The best way to describe the experience of a Masterclass is to let people who have been on one tell the story. You could also read the article by David Lilywhite for Octane Magazine. It was published in February 2009 - that's back in the early days of the course. Masterclass started in August 2007 and Steve Ivermee was there. His review of the course was published in HPC Magazine. Send someone on one of Don's courses by giving them a Voucher. Demonstration laps and talk about tyres in Don Palmer's videos. Find out more about who I am, my passions, mentors and coaching style. 2013 Don Palmer. All rights reserved.